Drew Angerer/Getty ImagesAmazon CEO Jeff Bezos. President Donald Trump is “obsessed” with Amazon, a source told the news website Axios. The president is considering targeting the retail giant’s tax status or antitrust action. Trump blames Amazon for the decline of brick-and-mortar retailers and the pain that has caused real-estate developers. And he thinks the company is getting a free ride from the US Postal Service. Watch Amazon’s stock price in real time here. President Donald Trump is “obsessed” with Amazon, a source told the news website Axios, and is eyeing legal means to go after the online retail giant. According to the Axios reporter Jonathan Swan, Trump believes Amazon is a negative force for smaller, locally owned retailers and wants to find a way to curtail the company’s dominance in online shopping. According to Axios’ sources, he is considering a change to Amazon’s tax status or a crackdown down through antitrust rules. The Supreme Court is already considering a case that could give states more power to collect sales tax on online retailers. While Amazon already imposes the applicable state sales tax on goods it sells, when a third-party seller uses the platform, it is up to that seller to collect sales tax. Many third-party sellers on Amazon do not collect those taxes. 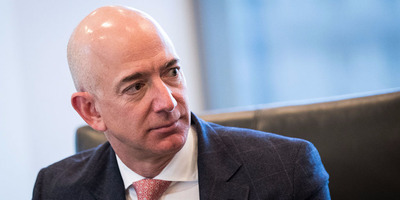 Trump hasn’t been shy about his distaste for Amazon and its CEO, Jeff Bezos, previously tweeting that the retailer is hurting the US Postal Service and attacking Bezos for his ownership of The Washington Post. Concern over Amazon’s effect on the American retail landscape is widely held. But Trump’s grumblings about the company’s relationship with the US Postal Service seem unfounded, given that much of the USPS’ financial woes come from funding mismanagement, pension obligations, and the non-package side of its business. According to Axios, Trump has also soured on Amazon in part because fellow real-estate developers have complained to Trump that the company is helping to kill off brick-and-mortar retailers and malls. Axios said the president did not have a clear plan to go after the company yet. In response to the report, White House Press Secretary Sarah Huckabee Sanders said that the president is not currently pursuing a new policy targeted at Amazon. “We have no announcements and no specific policies or actions that we’re currently pushing forward or considering taking,” Sanders said at Wednesday’s press briefing. Following the report, Amazon’s stock fell roughly $US63 a share, or 4.2%, as of 2:50 pm ET to $US1,434.10 a share.